It’s been a week of real upheaval at Gresty Road after the news that boss Steve Davis was relieved of his duties was announced last Sunday. The 51-year-old had been at the helm since November 2011, making him the fourth longest serving manager in all four divisions of English football, but eventually paid the price after the 3-0 loss at Mansfield. That result made it a run of five defeats in seven league games and one win since October 29, with just two victories in the previous 21 games in all copmetitions as Crewe plummeted to 18th place. Home fans have had a serious lack of enjoyment this season too, witnessing just one win since mid-September, that a 2-1 success over Morecambe on November 22. Lack of goals was a serious issue too in Davis’ last few weeks in charge, as Crewe have not scored in their last three matches, netting just the twice in their previous seven outings as well. The Railywaymen didn’t hang about in appointing a replacement to try and turn things around though with former Alex defender and promotion winner David Artell promoted from his role as academy operations manager. On taking the job, he named the club’s U18s boss and Crewe stalwart Kenny Lunt as his number two and will also seek help from U23s coach Alex Morris and head of recruitment Neil Baker. Speaking to the Alex official website, Artell claimed he will be like a ‘human magpie’ in his bid to pull the club clear of safety, saying: “I know what it takes to win. I have had promotions in my career and played at a good level. If you know how to win then that is 80 per cent of what you need. “I will then bleed knowledge from those working with me. They have great knowledge about the game. Kenny (Lunt) and (Alex Morris) are fantastic coaches. It is the same with James (Collins). They are all tactically astute and I want to lean on Neil Baker like a lamppost. “When Dario (Gradi) is back in the building, then I would like the opportunity to tap into his knowledge as well. “One of my great strengths is that I’m like a magpie. I like to absorb knowledge and use it. Between us all there is enough here to get it right. However the decision to replace Davis wasn’t met by universal support from within the camp as Crewe captain and player coach Ryan Lowe told BBC Radio Stoke: “Obviously, Dave’s been given the nod. “I hope he does well and we’ll have to now see where this takes us. “I’ve played with Dave a couple of times, at Chester and Shrewsbury, and we get on a like a house on fire. But that’s football. I’m always there to lean on, whoever it may be. Crewe were quick to announce their first business of the transfer window recently too, extending the loan deal of exciting Chelsea winger Alex Kiwomya until the end of the season. Team news: Luton striker Danny Hylton is hoping to be fit enough for selection against Crewe this weekend after a rib injury against Portsmouth recently. Scott Cuthbert and James Justin are both expected to be available too, leaving Cameron McGeehan (broken leg), Dan Potts (knee) and Akin Famewo (tendinitis), plus long-term injured duo Danny Green and Nathan Doyle out of action. Top scorers: Hatters: Danny Hylton (14). Alex: Ryan Lowe (8). Man in the middle: Graham Salisbury. Has officiated 23 games so far this term, showing 68 yellows and four reds, including two in the recent clash between Rochdale and Chesterfield. 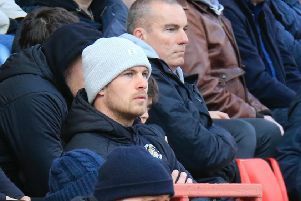 Taken Luton once this season, the 1-1 draw with Mansfield at Kenilworth Road, while last term, he had the whistle for Town’s 2-1 defeat at Barnet, awarding the hosts a penalty in stoppage time after Scott Cuthbert’s handball. Also refereed Luton’s 3-1 win at Cambridge, dismissing the hosts’ Harrison Dunk for two yellows. Been in charge of Hatters a further eight times in his career, with Town winning five, drawing two and losing just one, showing two more reds in that time, sending off Tom Naylor as Luton won 1-0 at Cambridge in September 2014 and Hatters’ Kevin Nicholls in a 1-1 draw against Plymouth in 2004. Gary Hilton and Barry Cropp are the referee’s assistants, with fourth official Martin Woods. In charge: David Artell - 36-year-old who began his playing career with Rotherham United, winning successive promotions from the Third Division to the First Division from 1999 to 2001 and then joined Shrewsbury Town. Had spells with Mansfield Town and Chester City, before heading to Morecambe in July 2007 and went to Crewe Alexandra in June 2010, captaining the Railwaymen to victory in the 2012 League Two play-off final. Further spells at Port Vale, Northampton Town, Wrexham, Bala Town, Port Talbot Town, Kidsgrove Athletic and Droylsden followed as he also won also won seven caps for the Gibraltar national team between 2014 and 2015. Was appointed manager of Crewe Alexandra this week after being promoted from his role in the club’s academy. View from the dug out: David Artell, speaking to the club’s official website: “Luton are a good footballing side. They like to get the ball down and play. “Their manager has implemented his philosophy and he likes to play the right way. That is not to say that they cannot mix it up because they can and we will have to match them for that as well. “They are always well supported and it is a good game to start with. We are at home and in need of a win ourselves. If we play to our potential then there is no reason why we cannot turn them over. One to watch: Alex Kiwomya, 20-year-old Chelsea winger, who has had an excellent spell on loan at Crewe this term, scoring seven goals in his 25 appearances so far. Bagged five in his first nine matches after joining from Stamford Bridge, before a dislocated shoulder saw him out of action for a while, but he returned to Gresty Road and has since agreed to stay until the end of the season. Played for both: Mike Newell - joined Crewe Alexandra after being released by Liverpool in 1982, before quickly heading to Wigan and was then snapped up by Luton for £85,000 in 1986. Netted 19 goals in 68 games for the Hatters and was then sold to Leicester City, having spells at Everton, Blackburn, Birmingham, West Ham, Bradford and Barnsley, until returning to the Railwaymen in 1999. After stints at Doncaster and Blackpool, he was appointed manager of Hartlepool and then Luton in 2003, winning promotion to the Championship before his departure in 2007, going on to have brief spell at the helm of Grimsby Town too. More recently, Newell has been on the coaching staff at League Two Accrington Stanley. We’ve got form: Luton have a simply terrible record at Gresty Road, having lost eight of their 10 previous visits, winning just the once and drawing the other since their first trip, a Division Three clash in 1963. A run of five straight losses was ended by a goalless draw in Division Two in 1997, but it took almost 40 years to leave with that winning feeling, as Steve Howard’s late goal settled a Division Two contest in favour of the visitors in October 2002. In total, Hatters have scored just five goals, drawing a blank on five occasions, never netting more than once, and conceding 17 times. Last time out: Luton fell to a 2-0 defeat on their last visit to Crewe, that in League One back in October 2007. Ryan Lowe opened the scoring on 14 minutes before he then made it 2-0 five minutes before the break as Hatters couldnt fight back in the second period. Luton: Ben Alnwick, Richard Jackson (David Edwards 70), Jaroslaw Fojut, Chris Perry, David Bell, Alan Goodall, Matthew Spring, Don Hutchison (Steve Robinson 70), Darren Currie, Calvin Andrew (Dean Morgan 58). Paul Furlong. Subs not used; Chris Coyne, Ahmet Brkovic.